So it seems as though another person has auditioned for this 'Aaliyah role'. She goes by the name of Keshia Chanté. A lot of you will probably know her famously for her paying homage in a few magazine photoshoots, where she depicted our beloved Babgygirl. We have also encountered some fake fans who from those very same pictures, have gone on to claim it's Aaliyah (like seriously are you dumb? lol) To narrow it down, this is the girl who people have always talked about in terms of her high resemblance with Aaliyah 'looks wise'. Now I aint gonna lie, she does have 'some' resemblance towards Babygirl, not 100%, but you can definitely see it. 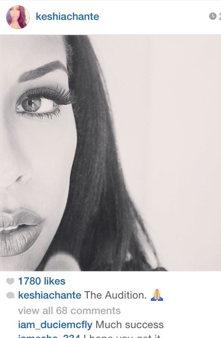 From the picture shown below, Keshia Chanté posted a very alluring picture of herself with the caption –"The Audition"
Keshia Chanté: "What I will say is…I did meet a few people production company wise that are developing the Aaliyah movie and they spoke to me about playing her in the biopic of her life. And from my understanding, there are people trying to create a movie and Aaliyah’s family are still mourning her loss and aren’t ready to share her story and create a film. So there’s a bit of back and forth thing with her family and with creative people. …unfortunately from my understanding they don’t have complete control of her estate. So a movie could technically be made without them green lighting it and I kind of think that’s unfortunate. So I want her family to be on board and to be happy with it. It’s still kind of lingering in the air. I would love to play the part. I’m a huge fan of Aaliyah…I would want to do it justice and exceed people’s expectations of it."